Many homeowners complain of noisy water pipes and poor water pressure, even though they have only just moved into their newly built home. The most common reason for this is that the piping system that has been installed for the hot and cold water supply is utilising fittings that restrict the flow of water and therefore reduce the pressure delivered to the tap. When a fitting has a smaller nominal bore than the pipe, it creates a flow restriction, which in turn causes turbulence, resulting in pressure reduction and often produces noise. The Aquatechnik Safety System utilises fittings that are the same nominal bore as the pipe itself. 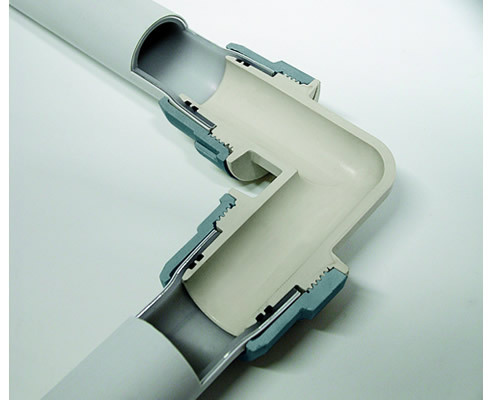 The pipe is expanded to accommodate the fitting, rather than a smaller diameter fitting being inserted inside the pipe. The result is a considerably quieter system with minimal loss of flow and pressure. The system is extremely simple to assemble, and comprises a multi-layer (Pex-Al-Pex) pipe in sizes ranging between 16mm and 63mm, and lead free, reusable PPSU (Polyphenylsulfone) fittings. For further details on the Aquatechnik Safety System, or to arrange a demonstration, visit www.aquatechnik-australia.com.au or call 1800 278 283. I would like to enquire about Aquatechnik Australia.